Traditional pesto is a thick pasta sauce from northern Italy made of crushed herbs, garlic, pine nuts, grated parmesan and pecorino cheeses, salt and extra virgin olive oil. The name implies that it originated in Genoa, the capital of the Ligurian region, but its roots may go as far back as Ancient Rome. Basil, the essential ingredient came to Italy from North Africa in the time of Ancient Rome, but it originated in India, Iran and other tropical regions of Asia, having been cultivated there for more than 5,000 years. Asian varieties of basil taste quite different from Mediterranean basil, having a sharp and spicy tone. Pesto is closely related to Liguria and to Genoa, because of the unique microclimate and the soil, ideal for growing several varieties basil. 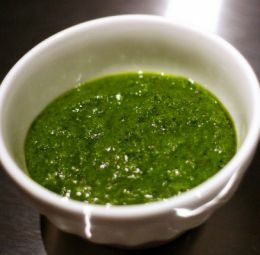 The traditional method of making pesto is with a marble mortar and a wood pestle (hence the name "pesto"). In order to allow the full release of the aroma, the basil leaves need to be crushed by hand in the mortar, using a round movement of the pestle, breaking the veins of the leaves and squeezing out the oil, rather than simply pounding the leaves. This is still considered to be the best way of preparing pesto. The Genovese sauce is green due to the basil. Pesto alla siciliana, sometimes called pesto rosso (red pesto), is similar to Genovese pesto but with much less basil and the addition of tomato, and almonds instead of pine nuts. Pesto alla calabrese, from Calabria, consists of grilled bell peppers, black pepper and peperoncino. These ingredients give it a distinctively spicy taste. The traditional pasta to go with pesto are either trofiette or trenette (Trenette al Pesto). In a small skillet over medium heat, add the pine nuts and lightly toast until brown, shaking the pan continuously, about 3 to 4 minutes. Put the basil, the 1/4 cup pine nuts, garlic and the 1/2 tsp salt in a mortar. Using a pestle, grind with a rotating motion until a paste forms, about 5 minutes. The circular motion is needed to break the veins of the basil leaves instead of just crushing the leaves, as the veins contain the fragrant basil oils. Sorry, a food processor will not do in this case. A little elbow grease is required, while enjoying the fact you are preparing food the same way the Ancient Romans used to. Adjust the seasonings with salt. Pour a small amount of olive oil on top of the pesto. Set aside. In a large bowl, combine the pasta, pesto and the reserved cooking water and toss gently to combine. Garnish with cheese and additional crushed pine nuts. Serve immediately. Reduce the amount of pasta to 2/3. Substitute 1/2 lb each of boiled haricot verts, and boiled and sliced potatoes. In a large bowl, combine the pasta, haricots verts, potatoes, pesto and the reserved cooking water and toss gently to combine in a classic Ligurian preparation. Garnish with cheese and crushed pine nuts. Serve immediately.